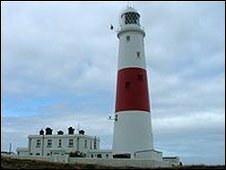 Coastguards have criticised footage posted on YouTube of youths taking part in a practice known as "tombstoning" from cliffs in Dorset. The footage, which was uploaded three days ago, shows three males jumping from Pulpit Rock, Portland. Sonny Wells, 21, who was paralysed after jumping from South Parade Pier, Southsea, a year ago, told the BBC, "it's just not worth the risk". A new campaign has been launched by the Maritime and Coastguard Agency (MCA). The 38-second YouTube clip is just one of a number shot by the public and posted online showing stunts across Dorset and Hampshire. On Wednesday, a 14-year-old boy suffered head and arm injuries after "tombstoning" off Ilfracombe Pier, Devon. In May two men died after they jumped from cliffs in Whitburn, South Tyneside and Milford Haven, Pembrokshire, in separate incidents. Former soldier Mr Wells, of Waterlooville, Hampshire, is now in a wheelchair. 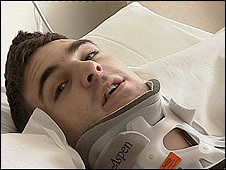 He was told by doctors he will be paralysed from the chest down after breaking his neck from the 9m (30ft) fall into 1m (3ft) of water. He said: "There has been enough about me over the last year and people are still doing it. "You can't stop people from doing it. If they end up in a wheelchair then it's their own fault. It's not worth the risk." The MCA said that in the last two years there had been nine deaths and 18 serious injuries from people taking parting the craze. Spokesman Fred Caygill said: "Already this year we have seen two people die from this activity of jumping from heights into unknown depths of water. "There's a very good probability in that we will see more injuries or possibly deaths from the activity before the year is out." The MCA has launched a poster campaign, Don't Jump into the Unknown, which has a barcode featured on it for teenagers to scan with their mobile phone linking to a website.